I am proud to count myself as a Rock Island Kiwanian. For the past 15 years, I have spearheaded a project in the club which we have dubbed “Coats for Kids”. It has grown and morphed over time, but what we currently do is pick up 50 “at-risk” Rock Island/Milan School District students (with the help of our friends at Johannes Bus Service), transport them to the Quad City Botanical Center, feed them a “kid-friendly” lunch and allow each of them to choose a new winter coat, hat and mittens. 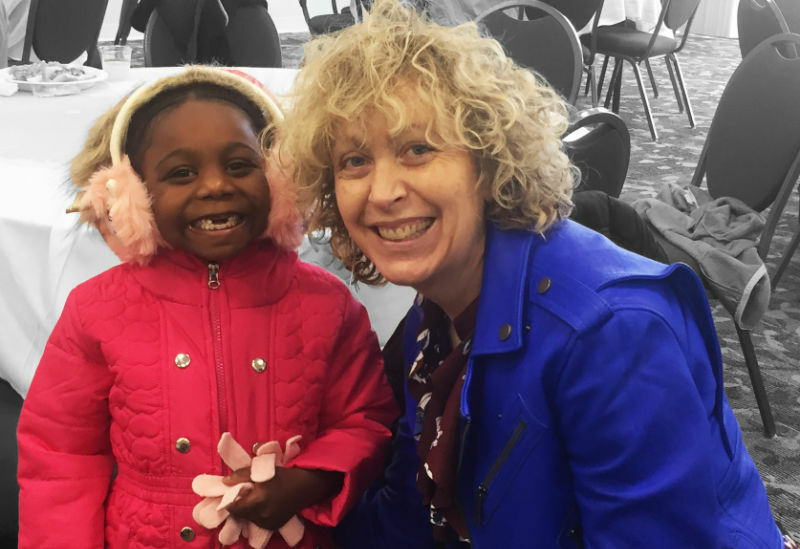 Just like Johannes, our terrific supporters at the Botanical Center and Bridges Catering need to take a bow for the love and generosity that they help us spread every November to these children whose families cannot afford to supply them with warm winter apparel. This is always my favorite Kiwanian event of the year and this year was no exception. It’s a labor of love to recruit volunteers, purchase all the coats, hats and mittens, coordinate the bus schedules, etc., but the pride in the kids’ eyes at their new items and the joy on their faces as they heartily attack a second helping of “chocolate marshmallow fluff” makes all the effort so worth it. When I am 90 years old and look back on my life, memories of the 2018 Coats for Kids event will be a special treasure that I take out, examine and feel all warm about. I’ll close my eyes and conjure a picture of this beautiful little girl in her new pink coat. It was captured as I roamed the room, talking to the children and making sure that everyone was having a good time. She called me over with a shy smile. When asked if she liked her new coat, this adorable little girl told me that pink was her favorite color and this was the nicest coat she should ever had. Then, with wonder in her eyes, she asked me how I had known that she liked unicorns. She had chosen a set of fuzzy, warm earmuffs with gold, sparkly unicorn horns adorning each side. I told her that I had chosen them just for her and that she looked just like a unicorn fairy princess. She beamed with pleasure and my heart melted right then and there. This Thanksgiving, please join me in giving thanks for all the blessings in our lives, even the sparkly unicorn horns and chocolate marshmallow fluff.